Looking for a business partner with integrity? We employ only highly experienced factory-trained service technicians, assuring prompt and efficient service. When you choose to do business with Yuma Office Equipment, you get much more than top quality copiers, faxes and digital imaging products, you get FAST AND DEPENDABLE SERVICE! Our office administrative personnel are available to service your needs without delay. Yuma Office Equipment recognized as ENX magazine "Elite Dealer 2015"
2013 - Yuma Office Equipment announces new ownership of long time employee Daniel Bombard. Yuma Office Equipment partners with DocStar, Document Management Software. Yuma Office Equipment Hires IT personnel for all Server, Computers, Networking & Connectivity jobs. Yuma Office Equipment proudly becomes Authorized Sharp Dealership for MFP, Copiers, Fax & Printers. 2009 - Opened full IT support team offering Servers, workstations, networking, and all connectivity needs. 2006 - Yuma office equipment moves to 340 S Main St. a 3,700 ft. facility dedicated to sales and service of office equipment for Yuma county. Yuma Office Equipment becomes Authorized Ricoh/Lanier Dealership for MFP, Copiers, Fax & Printers. 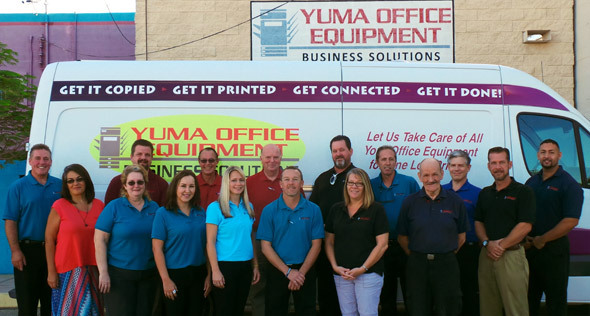 Yuma office equipment moves to 1045 S. 4th Ave. a 3,000 ft. facility dedicated to sales and service of office equipment for Yuma county. 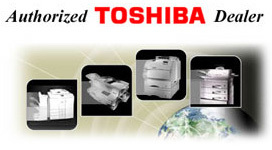 2000 - Yuma Office Equipment became Authorized Toshiba Copier & Fax Dealer for Yuma and Imperial County. Also partnered with Network Connections an established computer and networking company. Offering a one-stop shop for all office equipment needs. 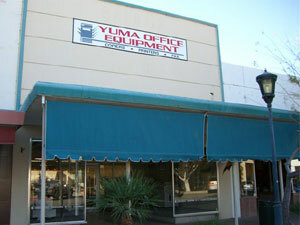 Yuma Office Equipment is staffed with all long-term employees, several from Yuma Office Supply Business Equipment. Representing over 75 years experience. 1994 - Yuma Office Supply Business Machines became Yuma Office Equipment, Craig Crossland, General Manager. 1993 - Sold supply division to concentrate on copiers and related equipment. 1992 - Established C & C Leasing Co. Offering in-house leasing. Ricoh Master's Club "Outstanding Sales Award"
IBM "Dealer of the Quarter"
Top 10% of dealer sales in U.S.
1985 - Entered facsimile market as the authorized Sharp Fax dealer. 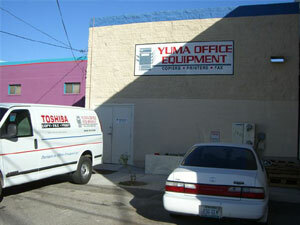 1978 - Yuma Office Supply moved to larger facility on 4th Avenue. Entered plain paper copier market as the authorized Sharp and Savin Copier dealer. Craig Crossland named manager of Crossland Office Equipment & Seven Seas Leasing Co.